Oscar J. Tolmas Charitable Trust Funds Jewish Community Day School Head of School Chair! Significant gift demonstrates vote of confidence in future of JCDS. The Oscar J. Tolmas Charitable Trust has given the Jewish Community Day School (JCDS) a significant gift to fund the Oscar J. Tolmas Head of School Chair for the next five years. 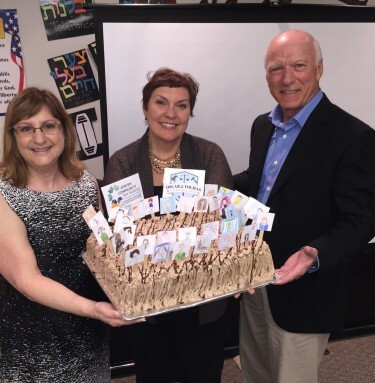 Through this partnership, the Trust is helping to ensure the vitality of Jewish Community Day School educational leadership for years to come. According to JCDS President of the Board of Directors, Lis Kahn, this will be a meaningful way to memorialize Oscar Tolmas, and a fitting tribute to his commitment to tzedakah, community, and enrichment through Jewish education and values. "The Head of School position is fundamental to the school's success," Kahn said. "This generous gift will ensure the Jewish community continues to have a skilled administrator, strategic leader, strong educator, accomplished fund raiser and communicator, and inspiring visionary. JCDS Head of School Sharon Pollin joined JCDS in 2013. Sharon holds a Bachelor's degree in elementary education, a Master's degree in education supervision and administration, has engaged in advanced Jewish learning at the Pardes Institute for Jewish Studies in Jerusalem, and is currently a doctoral candidate in education leadership. Sharon comes from generations deeply committed to Jewish community. She was a Federation Young Leadership member and was fortunate to participate in the Wexner Leadership program. She has been Director, Principal, and Head of School throughout her career as a passionate, Jewish day school leader. Over the past three years, Pollin has grown the number of students to the school by 22 percent. JCDS reopened its Pre-kindergarten classes and Kindergarten classes. A Young Baby Program for infants aged 3 - 15 months was successfully launched this year. She has helped to build a rejuvenated and dedicated board, new professional staff leadership, an excellent faculty and a robust curriculum. JCDS was also accepted into the Governance and Fundraising Academy, a prestigious program of the Partnership for Excellence in Jewish Education, and funded by the AVI CHAI Foundation. Community connections have also been revitalized as Pollin has reached out to agencies and institutions through a variety of collaborations and sponsorships. "With this game-changing contribution from the Oscar J. Tolmas Charitable Trust, Jewish Community Day School is on an exciting path for a sustainable and successful future," Pollin said. "We so appreciate the outstanding efforts of Vincent Giardina and Lisa Romano, trustees of the Oscar J. Tolmas Charitable Trust, who are devoted to the mission and committed to the philanthropic responsibilities placed upon them by the late Oscar J. Tolmas."